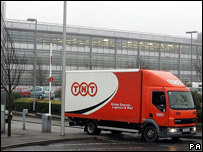 The search for the two missing discs containing the details of 25m Child Benefit claimants has moved to a number of depots of courier company TNT. The computer discs went missing after being put into the internal post at HM Revenue and Customs in Tyne and Wear. Police are now focusing on premises of TNT, which delivers HMRC mail, after completing inquiries at HMRC's offices. A spokesman for TNT confirmed that its premises in London had been searched on Friday night. He said it was impossible to say whether the CDs had ever entered TNT's system. "We are all working on that theory, but it cannot be proved one way or the other," he said. The missing discs hold the personal details of all families in the UK with a child under 16. The data on them includes the name, address, date of birth, National Insurance number and, where relevant, bank details of 25 million people. The discs were intended for the National Audit Office (NAO) in London, but never arrived from HMRC's office in Washington, Tyne and Wear. Police looking for the discs completed their search at the Washington HMRC building on Friday night. A Scotland Yard spokeswoman confirmed searches had now started at TNT buildings, but would not say at how many or reveal the locations. A core team of 47 detectives from the Specialist and Economic Crime Directorate has been involved in the search operation. The TNT spokesman said the sender of the CDs had used the firm's general mail service rather than its facility that allows customers to monitor the progress of deliveries. However, TNT was fully co-operating with police, he said. He said the firm carried up to 100,000 items of mail each night on behalf of HMRC, and also had contracts with other government departments and bodies. In March, officials at HMRC began the practice of downloading the entire Child Benefit database onto CDs and sending them through the internal mail to the NAO for auditing. The practice came to light only on Tuesday when it was revealed two discs had been lost - raising fears data protection laws had been broken. Prime Minister Gordon Brown told MPs he "profoundly regrets" the loss of the records and he apologised for the "inconvenience and worries" caused to families. He said the government was working to prevent the data being used for fraud. But Conservative leader David Cameron said the government had "failed in its first duty to protect the public". On Friday, it also emerged that the NAO had handed unencrypted discs containing details of all Child Benefit claimants to accountants KPMG. The NAO said they had been delivered by hand and returned safely. Meanwhile, accountancy firm Grant Thornton has warned that the loss could be repeated if plans to reshape HMRC, including "slashing its funding and staff", continued. Francesca Lagerberg, head of the company's tax office, said the "hard-pushed" department was "being asked to provide more for less".